Like in every other American city after the advent of the automobile, Spokane planners had some big ideas for how to make the city better for cars. In 1936, the fever pitch was high, and for good reason. In 1900, about 8,000 motor vehicles were registered with state governments. In 1936, that number was 28.5 million. As the soaring popularity attests, the personal automobile had changed lives in fundamental ways. One of those ways dramatically altered the city core. In 1936, highways already crisscrossed the state and streetcars and autos were jostling for control of the road. Urban thinkers predicted greater change still. To deal with such traffic, planners envisioned a raised, double-decker loop of downtown streets for buses, trucks and taxis. 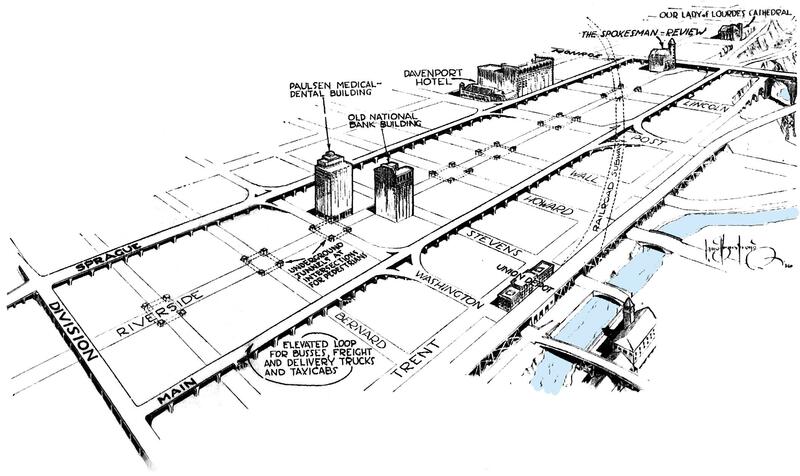 Intersections would have underground tunnels for pedestrians, to allow traffic to flow freely. The railroads cutting through the city core would be shunted underground in subways, while passengers would continue to board trains at the Union Depot between Washington and Stevens on what is now Spokane Falls Boulevard. Of course, traffic signals still very much exist. There is no elevated traffic loop. And city and business leaders desperately want to increase the number of retail businesses downtown, going so far as to coming up with a plan to offer a decadelong tax break for anyone who builds something on a parking lot.